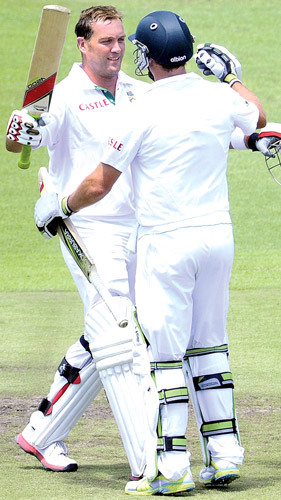 Sri Lanka lost two wickets after taking a pounding from South African batsmen Jacques Kallis and AB de Villiers on the second day of the third and final Test at Newlands on Wednesday. Sri Lanka were 149 for two at the close in reply to South Africa’s 580 for four declared, a deficit of 431 runs. Mithun Perera shot a four under par 67 to move into the lead by one stroke from overnight leader K. Prabagaran who was one under par 70 in the UTE-Cat Sri Lanka Open Golf Championship second round teed off at the Royal Colombo Golf course yesterday. Sports Minister Mahindananda Aluthgamage has approved the Sri Lankan cricket squad for the forthcoming South Africa ODI series which is to be worked off from January 11 to 22.